1/2 off thumb drive for current members. 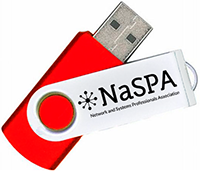 It's all here in one neat little package that proudly displays the 32 year old NaSPA name. Even better, this drive is also a bootable emergency drive that contains Linux Mint and other utilities. It doubles as a troubleshooting drive for times when a PC dies or becomes infected with viruses. We have already used this drive to help a friend resurrect his treasured family photos from an infected Windows PC, and we have not even released it yet! Well, now here it is for you because you never know when you might need it. When you do, it will be right on your key chain.